4/24/2019 12:41:28 AM - It's been a minute, I hope everyone is doing well and enjoying the first of the Spring season. Still nippy here in Long Island, NY, but today was the first day that I was able to sit outside while trying to learn my lyrics, watching my son with his friend riding their scooters up and down the street, and admiring the crocuses that have blossomed in our flower bed. A hot mug of tea is still called for, but soon enough that will change to cool glasses of mugicha (barley tea) and prosecco in the evenings. 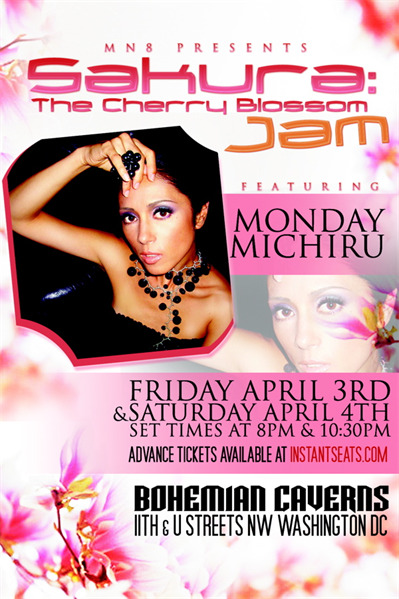 April 3 & 4 - MN8 Presents Sakura: The Cherry Blossom Jam in Washington DC at Bohemian Caverns -- I am excited about the upcoming performances at the famed Bohemian Caverins which we were fortunate to perform at last year (what a history this club has!) and this time for a two night engagement! I'll be bringing with me my NY crew with David Gilmore (guitar), Fima Ephron (bass), Gene Jackson (drums), and Sasha (last year he missed the gig because of conflicting schedules). We will be performing many of the songs from the NEXUS album, as well as some oldies but goodies from my repertoire. As the title reflects, we will be fortunate to be there for the beginning of the DC Cherry Blossom season which is famous throughout the world and might even rival what we see in Japan. So anyone interested in not only catching our performance, but also be able to experience the cherry blossom "hanami," this is the place to be next weekend! April 3 & 4 (Friday & Saturday), set times at 8 p.m. & 10:30 p.m.
Advance tickets available at instantseats.com, or online at the Bohemian Caverns site. April Japan NEXUS Tour -- I'm very excited this time to be playing with my band for the first time in a few years in central Tokyo, as well as in Osaka, Nagoya, Fukuoka, Kanazawa (first time!) and Matsumoto. My band consists of Yoshihisa Suzuki (guitar), Jiro Okada (bass), Masanori Amakura (drums), and Sasha (trumpet/flugelhorn). See below for the dates, and I hope to see some of you there! 1st Set: 6:00 p.m., 2nd Set: 9:00 p.m.
1st Set: 6:30 p.m.; 2nd Set: 9:15 p.m.
1st Set: 6:30 p.m.; 2nd Set: 9:30 p.m.
1st Set: 7:00 p.m.; 2nd Set: 10:00 p.m.
1st Party: 4:00 p.m. - 6:00 p.m.
Other News -- There's been a few fun projects I was involved with released or to be released soon. - From yet another Grand Gallery compilation, this one entitled "For Lovers Only," label boss Yasushi Ide asked me to remake Brand New Heavies "You Are the Universe" which I also produced, released in January. - The 80's classic rock songs remake project "Rock Legends Reborn ~ acoustic cafe ~" produced by Kyoji's Sound Wonderland, I sang the surprisingly bossa nova friendly "I Was Made For Loving You" by Kiss; released January 21 through avex trax. - "Everything Is Alright" 12-inch single by Yellowtail feat. you-know-who, just released February 19 on Bag Pak Records with 3 killer remixes by Daisuke Tanabe, U-Key and Kay Suzuki; making quite a buzz in various circles both in Europe and the U.S.
- A cover of the George Duke classic "Brazilian Love Affair" single by Soulfeenix feat. your's truly; to be released April 3 on Xtrasolar Records. - A track from designed people's debut album "Let's B Free"; the album taps into that Japanese post acid jazz and dance scene, with the song I co-wrote "Breathe" in a bossa-house flavor; to be released April 15 in Japan. I have an interesting offer which I can't get into now but hopefully I can announce in the next newsletter. Until then, I hope everyone is healthy and slowly putting away their wools and ready for the warmer days ahead! Hope to see some of you at the gigs in April!